Wrangell – St. Elias National Park and Preserve, Wrangell Mountains and the Kuskulana River, Kuskulana Glacier, near Nugget Creek mine. Winter, Alaska. 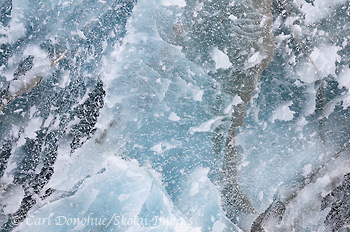 This photo is a closer look at the ice wall on the Kuskulana Glacier, from the photo I posted last week. I probably spent about an hour or 2 here, checking out this fascinating place. Please click on the image above to view a larger version of this photo. 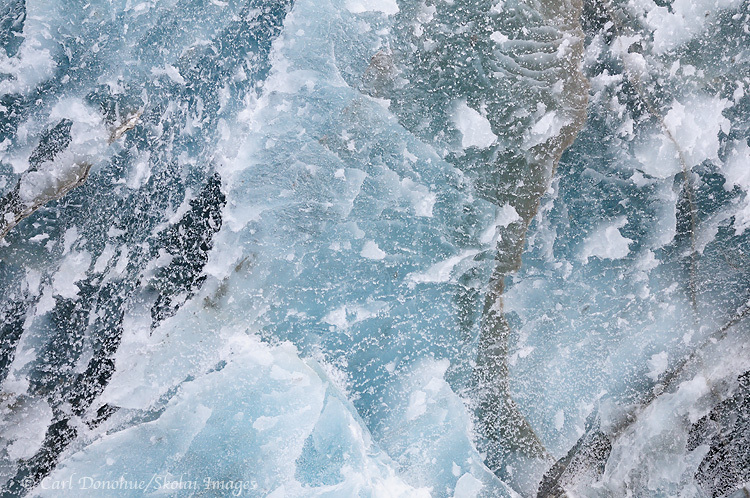 My friend Guy Tal posted (as usual) another great read on his blog; “Photography and the Environment”. I urge you to read his treatise; it’s a solid piece. Guy has a great knack for writing on particular topics without seeming to offend those who disagree with him, which makes his a powerful voice. At the same time, he’s not wishy-washy. that’s a hard line to toe. I’d suggest, however, that this is the wrong question to consider.Turn it around; what if there were to be no more nature photographs? What if nobody photographed another sunset, another bald eagle, glacier, forest grove or great bear? What if no writer touched pen to paper to draft the next essay on climate change, the next article about mountain top blasting, or open pit mining, or overgrazing? What if poets stayed their ink, and said no more? What if musicians ceased their social commentary, singers fell silent? Cinematographers made no more nature films? How might THAT change public opinion? I’ll submit here that art DOES foster culture. The voices of writers, photographers, musicians, painters, dancers, film makers, etc, are worthwhile. The art we create moves people. Expression, both collective and individual, reinforces and shapes who we are, what we value, how we feel, how we think, move, talk, how we treat ourselves, each other; in essence, how we live. What if the voice for concern were left only to those who have none? What kind of culture would arise from a world where the only representatives of the natural world were those interested in nothing more than extraction and coin? This is precisely the kind of world that made the John Muirs, the Henry Jacksons, etc, so desperately critical. Rivers caught on fire and the greatest herds of wildlife the planet has ever seen are no more. Even given the great work of those luminaries, we still produce undrinkable water and unbreathable air; the skies rain acid, the ice melts and the polar bear vanishes. It’s frightening to contemplate where we might be today if these giants of conservation, artists all, stepped away from the fray because they wondered if their work might make no difference. No thanks; give me a world where “champions of the natural world” isn’t a phrase pertaining to competition and conquest, but a tribute to the voice of love and compassion. Consider the work of great artists as part of a greater coterie; the voice of Bob Dylan, of Rachel Carson, Henry David Thoreau, Ansel Adams, Henry Jackson, Art Wolf, Wendell Berry do not arise from a vacuum. Those voices are certainly some of the loudest and most poignant; fine soloists indeed. But even Aretha Franklin sings with a choir. These legendary artists arise from a bed of creativity, a giant web, that includes, many, many other artists. It is this bed that generates great art and great artists, and it is this bed that might precipitate social change. The universe didn’t give us one Jimi Hendrix. The universe gives us hundreds of thousands, if not millions, of kids growing up playing guitar, making music, making art; and Jimi’s incredible performances are part of that, an outgrowth of that web. Furthermore, artists don’t create single works. Artists make art, and maybe, sometimes, if we’re lucky, just one of those creations might generate public comment. Photographers shoot literally hundreds, thousands of images, in the vain, oft-concealed hope of possibly making one really great image. Cartier Bresson said “Your first 10,000 photographs are your worst.” So if your photo isn’t enough to truly nurture a change in public opinion, shoot another. And another. And yet another. The last point I might make here is a more personal one. My photography might not, probably will not, ever, “truly change public opinion”. But my photographic pursuits have changed my opinion; the ways I see the world, the things I care about, the respect I feel for the world around me, have all grown in leaps and bounds through artistic engagement, and continue to do so. That alone makes the quest meaningful. This entry was posted in Adventures, Aerial Photos, Cool stories, Forests, Moose, Northern Lights, People, Skiing and tagged Art, conservation, environmentalism, Guy Tal, Kuskulana Glacier, Landscapes, scenics, Wrangell - St. Elias National Park on January 26, 2011 by Carl D.
That made my heart ache at the thought. Literally. Love that image Carl and I couldn’t agree more with the post. Especially in todays world I don’t think you can have too much of a good thing – and that certainly includes beautiful images of the incredible world around us. If a picture is worth a thousand words then the multitude of nature images out there speaks volumns about why we should go on preserving the natural world wherever we can. Carl, your reply is excellent and Heather’s comment is great. The fact that your photography makes you aware is enough. Good thoughts here Carl. I would certainly hate to envision a world with no more nature photographs. There is no doubt the amount of personal growth and gratification we all gain from our pursuits. Of course no one should give up the hope, or all is lost. At times I really wonder though what it will take to convince someone of a mindset where the Earth is for humans to use in whatever way we need to for economic growth and human expansion. Maybe we will never see that day in our lifetimes. Maybe it will only take catastrophic events so severe that it makes the Deepwater Horizon look like a puddle of oil in a pond. I have no idea. But I refuse to give up hope. Thanks for the kind words, Carl! I consider you an excellent writer as well, which makes it all the more meaningful. * Of all the photographers who proclaim to pursue their art/craft with the goal of contributing to the welfare of the environment, how many indeed make a difference? * If indeed one aspires to make a difference, why pick photography when other means are far more effective and by a very significant margin? I believe many pursue photography simply because it is enjoyable and personally rewarding and, for those seeking an outlet for creative expression, it is a powerful medium. Why try to pretend it is more than that (other than the obvious marketing slant)? Certainly art makes a difference and if nobody photographed our natural world, we’ll be much worse off, environmentally speaking, than we would otherwise. This still doesn’t mean that the vast majority of photographers are actually making a difference with their images, no matter how well intended. Making a difference in environmental terms can be much better served by any number of things beside photography. Thanks for posting here. It always feel like a gift when you stop by and post. Thank you. What’s it matter how many “indeed make a difference”? If one makes a difference, isn’t that one more than none? That’s exactly what my point was when I said “the work of great artists is part of a greater coterie”. The work of those probably very few artists that does indeed stand out is a function of the whole, every bit as much the individual artist. Consider the writing, for example, of Rachel Carson; “Silent Spring” made an enormous impact, but it didn’t come out of a void, it arose along with how many other essays and articles that didn’t “make a difference” at all? In short, if it takes 100 photographers to shoot in order that one photographer makes a difference, then that’s what it takes. and * If indeed one aspires to make a difference, why pick photography when other means are far more effective and by a very significant margin? Well, why’d John Lennon write songs? Why’d John Muir write books? Or why does Scorsese make films? There are many approaches to initiate change, and I’d suggest that all are needed, not just one or 2 that pass your or my criteria. Furthermore, many artists choose more than one strategy. Muir, for example, lobbied tirelessly with the political figures of his day, but he also knew the voice of his pen was an intoxicating one. Sting has worked energetically for human rights and environmental causes, but he also writes songs about these issues, no? The vast majority of photographers might not be “actually making a difference” at all, but I’d urge that this is the wrong yardstick to use, for the reasons mentioned above. If just one arises from the mire and makes a difference, that’s enough. I’m sure the majority of shutter clicks you take don’t feed your soul either .. but when you make that one frame where it all really happens (such as Petrified Velvet, do you really care how many others you had to delete? I do think, at the same time, what you’re feeling is correct. It’s not uncommon at all for photographers to grab for the crutch of ‘conservation’ when questioned about their impact. Wildlife photographers shooting captive animals at places like Triple D game farm and then justifying this with cries of conservation are, IMO, more often than not simply being dishonest. They’re not attending game farms to ‘save the wolves’. And when photographers board a jet and curry around the globe, shooting whatever popular destination the latest magazine or forum tells them to, I think it’s more often than not simply dishonest to claim they offset this with the power of images in conservation. Some do, for sure, but many don’t give a rat’s cracker about such things. They want to have a good time, and shoot what they want to shoot. But I don’t think this negates the power and importance of nature photography in the realm of conservation. Carl, your last 3 paragraphs illustrate exactly the point I was trying to make. No argument that some do make great contributions. That is a beautiful image and unusual. I like your viewpoint and message here. It is uplifting, positive and you lead the way through sharing your own growth curve. I think Guy is right in that there is significant hypocrisy and overuse of green marketing even in nature photography. However, cynicism that few of us can make a difference is not the antidote in my book. Any difference is a good difference no matter how small, even if the person is still taking other damaging actions because they are not yet educated about everything they could do to decrease their impact. The point is they are going in the right direction. Maybe it will be too little too late, but if we lose hope that we can turn the whole thing around, we are by far more certainly doomed. Also, if you observe, and there have been studies on this, all change happens incrementally and grows exponentially. That is, all change starts out small and grows gradually until it reaches a certain critical mass and then it takes a big leap. This is why it is important to encourage any small steps people take, not that small steps will get us where we need to go eventually, I agree with Guy that we need sweeping changes or the desecration will catch up with us. However, to me the argument that Green isn’t Green enough so don’t be Green goes in circles and only discourages those who are just realizing changes need to be made.